After getting a hold of the recent 32-bit Windows 7 Pre-Beta build 6.1.6801.0 iso off one of the well known torrent search engines, I decided to try installing it as a virtual machine with VMware Server 2. 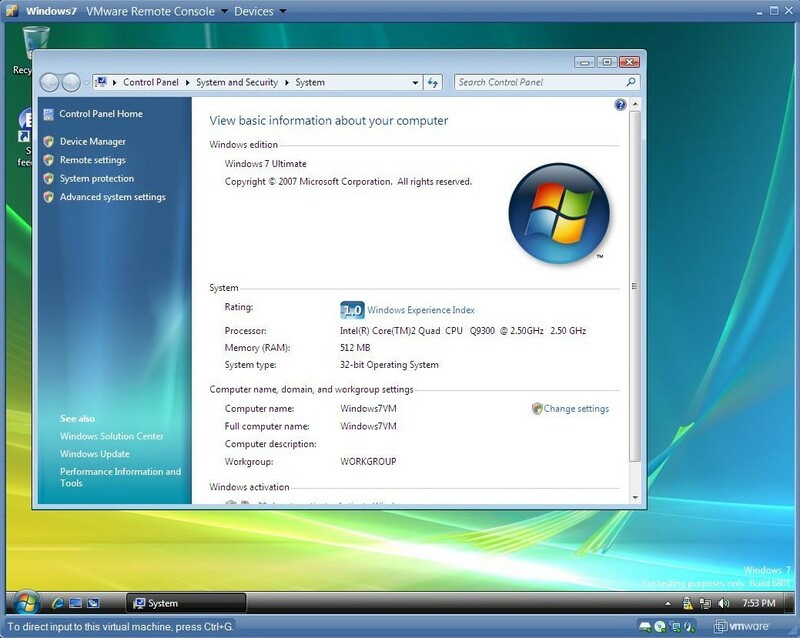 After very little setup, I had a working Windows 7 virtual machine. When you are asked what OS you are installing, select Windows Vista 32. After it is installed, install the vmware tools and you are all set. Unfortuantely the VMware video driver does not allow aero effects :( Surely that will come with time. If you wish to activate this distribution, you are in luck. There are a bunch of MAK’s (Multiple Activation Keys) available that can be used to fully activate this version of Windows 7. You can find those keys here.